Easy DIY marbled nail polish mugs make the perfect homemade gift! A simple craft done in a few minutes that looks like it took hours of work! 1. I’ll just jump right in and say…I had a great first day of school! There was no need for the nerves I felt this morning. Of course the stress about work is still there, but at least I like all my classes and teachers. Since I am a senior this year I was able to choose most of the classes I wanted, nothing mandatory except math and English. But here are the classes I am officially taking this year: AP Latin, Honors English IV, AP Photo, AP Psych, AP Government and Politics, Ancient History, Pre-calc I, Business Law, (Health and Gym obviously), Crime and Justice, and Forensics. Some are full year courses while 4 are 1/2 year electives so I have 2 the first semester and 2 the next. I filled my schedule so I have no done time like lunch or study hall, but I always hated those periods so I just eat lunch during one of my classes. All seems good and I can’t wait to see how this year plays out. It should be a good (but stressful) one! Plus now I am one more day closer to GRADUATING! 2. Purple Toes! I needed to freshin’ up my polish for school, so I chose the classy color of purple 🙂 I used Confetti Cosmetics Belle of the Ball polish. It describes the color as a deep lilac. Confetti is a cheap drugstore brand, but it actually has awesome polish. The color lasts a really long time! – Preheat the oven to 400°F. Prepare a foiled and lightly oiled baking sheet. 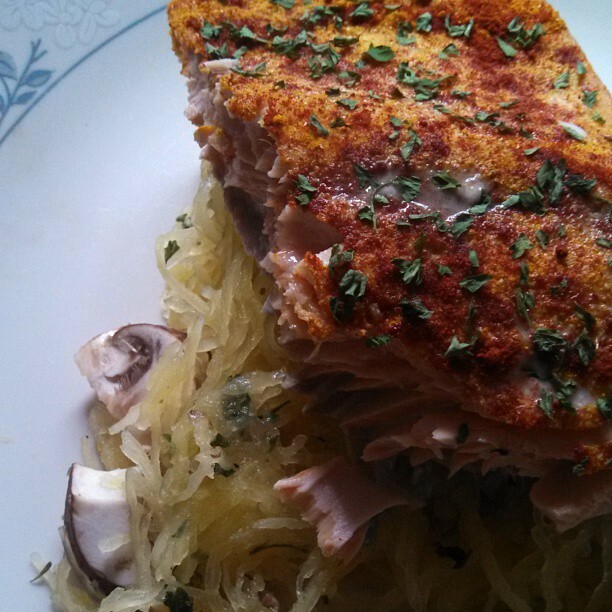 – Place your salmon down and pour on all the seasonings (adjust to your tastes). – Cook the salmon for 15 minutes or until it flakes apart easily. – Super quick and easy, but simply delicious! 4. I was featured on NJ Bloggers the other day and forgot to tell you guys! I sent in my “spotlight application” in the beginning of the summer but it finally was put up, yay! Alright, that is all I have for today! It ended up being a good day (not weather wise! It is cloudy and muggy just like yesterday, what a first day bummer!) but I am exhausted and just want to chill tonight and start gathering and planning school materials for tomorrow and next week! See y’all tomorrow with the Friday Finisher! How was your first day back to school (if you are currently going to school)? Do you like painting your nails bright colors or dark colors? I usually always go with something bright and fun, even in the winter. How is August treating you so far? It was rainy and gross all day Thursday, so August was definitely not off to a good start for me. I also was told not to come in for my internship yesterday since they knew it would be really slow an didn’t want me to just sit there. Haha! (sounds familiar). In other news I started reading the Aeneid (by: Virgil, translated by Robert Fitzgerald) for AP Latin next year (or this year…whatever). We just have to read the whole book and take notes (just bullet pointed summaries of events in books 1,2,4,6,8, and 12). So it is not too bad. Then right when school starts we will begin working with the Latin translation…should be fun :P. The Common App is finally up! Now I can start seriously working on my college applications! (I have been so mad that they wait this long to put it up. School is starting in a few weeks; so much for getting things out of the way. But I am planning on making this weekend great. I think I will go on a bike ride, do some cooking, cleaning, and cross other stuff on my to-do list. I want to be productive and hopefully that will happen! Thursday: Creator, Adapter, or Follower? Are you truly living up to you full potential? Or are you just doing your usual “best”? I thought this report was pretty interesting. There really are only a few “Big Brands” that drive and hold the mass food market. (With sugar and lies). It is okay to say no. You don’t have to be perfect all the time. I have never waitressed but this is really interesting. Be nice to your waitress/waiter. Do you find yourself unable to sleep during a full moon? Such a great list; love this! Are you able to stay present and focus on what really matters in life? #7, 12, and 15. Which are you guilty of? Balsamic Quinoa with Eggplant and Portobellas. Simply out this looks delicious! Tina’s Back Workout. I am always looking for new ways to work my back! GF Vegan Strawberry Apple Pancakes. Yes Please! Pulled Jackfruit Tacos. Have you ever tried Jackfruit? I really want to but have never seen it in the stores. + My iHerb buys! (although I had 1 disappointment. The NY Superfoods Inc. Gator Grit peanut butter I bought was a no go. I opened the lid and the foil safety seal was already about 3/4 of the way off. I didn’t feel safe eating it so I emailed iHerb for a replacement and am still waiting for a reply. Sad day :(. + 54 days (and going strong) of being (eyebrow and eyelash) trich free. + I love the new workout I created on Wednesday and my two weekly HIIT sessions went really well this week. My endurance is getting better and better. I think it helps that I read and catchup on my bloglovin’ feed while doing it. Makes the time fly by! + Pink Nail Polish. I love Clinique nail polishes, they stay on forever! But I still only ever paint my toenails. Painting my finger nails just doesn’t work out. Any good posts from the week you want to share? What language did you take in High School (or College)? Did you like it and continue it through to AP level? Do you hate painting your fingernails too? I just use my hands to much, no matter how strong the polish, it chips so quickly!